Was there any truth in what Mass Teddy said, could he really have become a millionaire? Mass Teddy often used to say he was a Scotsman, saying there was a ‘big estate’ in Scotland that his father should have inherited in the 1800’s. It was known by family members that he made enquiry’s into a Scottish estate and was contacted at Southfield by Solicitors or representatives? who tried to help him authenticate his claim. It is said that he was asked to provide proof of his birth or descent? As far as I am aware, nothing ever materialised from it. Mae, the eldest child of Mass Teddy, continued the investigations from New York but was told that it was too late because the estate in question had long been sold. However, she was told that land rental income of the estate still existed. These fees had been accumulating on the estate lands for more than a century. The Hodgson’s had not given up hope of claiming this huge fortune, which was believed to be in the £millions. Maybe it would be easier to claim it from the United Kingdom. Before Cecil set off for England, Mass Teddy told him to go and claim the estate when he got to the UK. Mast Teddy was excited and very adamant that Cecil would get the money. Cecil was now settled in the Midlands. About 1952, he travelled to London and visited the Public Records Office at Somerset House in the city of London. In search of the elusive Scottish estate, he hired a Solicitor who eventually located a Scottish will or document dated 1751 that was connected to the estate. He provided Cecil with a copy of it. Cecil then travelled more than 300 miles up to Scotland to see the estate. The London Solicitor had informed Cecil that the Scottish property, Eccles House, Berwickshire, had been advertised and sold off many years ago. He told him that because there had been a duration of more than 200 years, he would have to contest it, and this would come at a cost. He told Cecil that if his claim was unsuccessful, he would lose all his money. He wanted to apply for it, but because it would be very expensive to make the claim, Cecil didn’t pursue it for now…. When I first spoke to my dad in 1999 about our history, he mentioned to me that in the 1950’s, Cecil had shown him a 1751 will. My dad was a young man then, it was a long time ago, therefore his memory couldn’t recall for sure whose name was on it. He thought maybe Hodgson or Broomfield? He recalled seeing Huntingdon? and Kelso written. It is my belief that what Uncle Cecil showed my dad was, not just one, but a collection of several British and Jamaican documents. Broomfield (Bromfield) Huntingdon (Hassington) and Kelso. After nearly a long decade (2001-2010) of determined research going back and forth to Scotland, I finally resolved the mystery of ‘The 1751 Will’ when I visited snowed out Edinburgh for the umpteenth time in December 2010. I was very fortunate to solve it. My accommodation had been booked there for three nights to conduct a huge search at the Archives. I found nothing over the 3 days and was about to leave snowed out, yet picturesque Edinburgh the next morning but the window wipers on my car had frozen solid, causing a fuse to blow. The weather was treacherous so I called out my vehicle recovery to fix it and decided to stay for one more day. This proved to be a blessing in disguise. I went back to the Archives the very next morning and unexpectedly found the treasure trove that I had been frantically in search of for a decade. It had taken me a lifetime to find it. After I found the all important documents needed to solve the puzzle, I asked the Archivist if anyone else had ever requested to see these old dusty documents before. He consulted the Archives search registers that only went back 50 years and told me that nobody had ever requested to see the documents during that period. He also said it was very unlikely that anyone else had read them for 200 years. I noticed a blond hair inside the Archives box, which I carefully placed back into it. I will be revisiting again sometime in the future to recover that hair strand, in order to get it DNA tested. Could it belong to an ancestor? I am quite certain that Cecil never saw these documents that I found. However he may have found copies of some of them that had been registered in another building of the Archives. When I arrived home I studied the copies of the documents thoroughly for many months, then a few years later in July 2012 travelled back to Scotland. I had been to Eccles on several occasions before but had never before ventured past the gate entrance into Eccles House Estate. This time I decided to follow in Cecil’s footsteps by going onto the Estate. What I saw was breathtaking. After gaining permission to walk around the glorious estate, I video recorded it and photographed it. From reading the documents at home, I discovered that the 1751 story centred around two Scottish families who were neighbours related to each other, Paterson of Eccles House and Bromfield of Hassington Mains. Both of their properties were within a short distance of Kelso. Eccles House was a 45 windowed mansion. Mass Teddy’s father, Edward Chisholm Hodgson, had inherited Southfield Pen from a Bromfield in the 1860’s. He had an old will that mentioned Hassington Mains. This will was handed down through the family. Maurice Hugh Hodgson took it with him when he emigrated to New York in 1924. Mass Teddy and all his children were aware of this estate. Cecil would certainly have visited Hassington Mains at the same time that he visited Eccles House. Hassington Mains was a smaller country farmhouse. About 2002, I asked Maurice Hodgson’s daughter, Elinor, if she could send me a copy of the original will that her late father had in his home. “It has been laminated in a frame and has badly faded. It is unreadable and can’t be copied” she replied. Luckily the old will had been transcribed many years before, so she sent me a typed up copy instead. I was already aware of the Bromfield estate long before I solved the 1751 story. In fact, in 2001, I had met the owners of Hassington Mains – no relation to the Bromfield’s – and was invited into their home and allowed to photograph the house and estate. 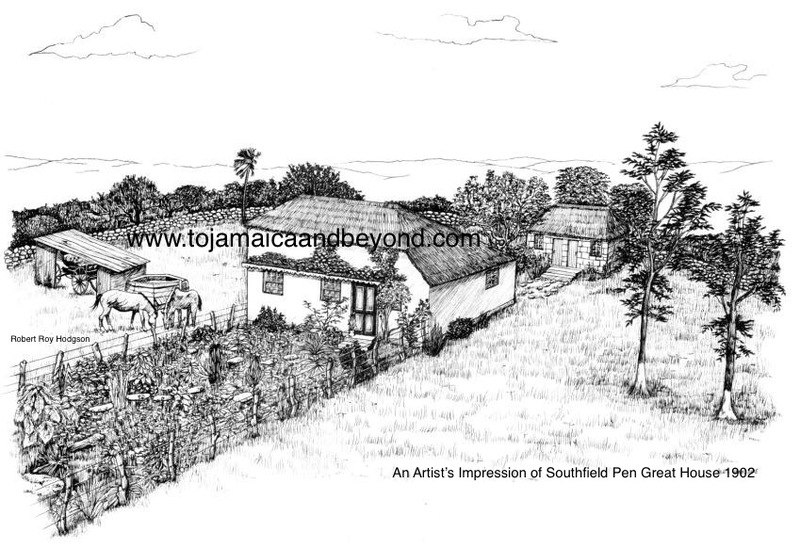 An interesting thing to note about the Bromfield’s of Hassington Mains is that a member of their family, who was residing in Jamaica at the time of the court case, would later become the owner of Southfield Pen. The two owners of the above properties in the 1780’s, Paterson and Bromfield, were both childless and become embroiled in a House of Lords court battle that would run through the 1780’s. It was to be a family fight that would end up seeing Eccles House Estate without a male heir, in debt and sold off. That event would ultimately leave a trail of potential heirs in Jamaica. Only a male could inherit. One considered heir, in later years, was to be Mass Teddy’s father Edward Chisholm Hodgson of Southfield Pen! Both of the Scottish families that fought at court – Paterson and Bromfield – were ancestors of Edward Chisholm Hodgson (Ned) of Southfield. You may be wondering; why Ned didn’t inherit or what If Cecil Hodgson had contested the 1751 will, would he have become a Scottish millionaire? To find all this out you will have to read the full detailed story of the Paterson’s and Bromfield’s. What I have posted today is just a ‘very brief’ summary of what has been discovered. There is so much more to tell and photographs to see from my visit to Eccles House Estate in 2012. It is a very long detailed story and will be covered in it’s entirity at a much later date using a series of many blogs running from 1687 through to the 1800’s period. It will be continued at a later date…. “I feel very proud to have traced the footsteps of my Uncle, Cecil Hodgson. Researching about part of his life and learning about The 1751 Will has been exciting, very time-consuming, expensive, but most of all it has been charming and extremely enjoyable. Discovering the places that Cecil visited in the 1950’s has been surprising. Walking around the grounds of those Scottish estates that are forever connected to our family has been brilliant. I find it unbelievable that my family, the Southfield Hodgson’s descend from such historic places in Scotland. I am really enjoying this blog particularly the story of the 1751 Will. I contacted you a few years ago re my Bent ancestry that I am yet to solve. Do you know why Mabel Bent Hodgson moved to Auchtembeddie where she had her first child. I am still no closer to finding any information about the parents of my 2 x g grandmother Elizabeth Bent-Levy. My dad & I are showing as 4th cousin match to you on Ancestry. Hello Joan, Thank you for reading and commenting on my blog, glad you are enjoying it. I believe we have been in contact before. I have thoughts about why Mabel gave birth to her first born in Auchtembeddie, in the parish of Manchester. It appears that she lived in Southfield when she fell pregnant, but her union with Mass Teddy was not approved by his parents, especially his father who threatened total dis-inheritence. I feel sure that the reason she moved out the parish of Saint Elizabeth, was to keep the birth a secret from his parent’s. I will be covering this subject in more detail by the time my story goes full circle to reach the early 1900’s. Regarding our DNA match, I will soon be uploading all 32 lines of my paternal and maternal ancestry going back to my 4th great grandparents, so hopefully we can solve who our ‘common ancestors’ are that we both descend from. In the meantime, I will review all your messages and see If I can find anything that could help. My mom and dad share DNA with each other, do you know if you share with both of them, or just one. My dad is R.H and my mom is I.E, both administered by me. I will have a look at mine and your DNA results soon Joan and check to see if I can spot anything that could help. Elizabeth Bent was about 40 years older than Mabel, but how they are related, I dont know. You may know that the parish of Manchester was formed from a segment of Saint Elizabeth. I do notice that Henry Bent snr ( Mabel Bent’s grandfather) had himself and a son, Ballard Bent, baptised at Manchester just after it had been formed. Maybe Elizabeth was another one of Henry’s children? What dates were Robert and Elizabeth’s three children born and what were their names. I will see if I can find their baptisms. I truly applaud your journey reasearching such historical events. I enjoyed reading your blogs and will continue to keep up with you as I am also writing my Autobiography. I am also related to Bromfields fro Clarendon . Keep up the good work my brother. Thank you for reading it and the nice comment. Oh wow, It would be interesting to know what branch of the Bromfield’s you stem from. Good luck with your autobiography, if you decide to run it as a blog send me the details and I will visit it. Hi Delvon I read your Jamaica Gleaner newspaper article yesterday, it is an amazing and uplifting story with a good ending. I am an experienced Jamaican family historian of 20 years, let me know if I can assist you with any help. Thanks for the reply Delvon. I can certainly help you as much as I can regarding tracing your family history. Just let me know what help you need. I can offer lots of advice and help on that subject. I will give you a call about it next week. I can appreciate the work put into the research here… Fascinating! Btw, for the record Norman Manley was not Jamaica’s first Prime Minister as labeled. Fact is he never became Prime Minister. Thanks for taking the time to read my blog, glad you enjoyed it. Many thanks too for noticing my typo error about Norman Manley being the 1st Prime Minister of Jamaica, how foolish of me, it was meant to read the “1st Premier of Jamaica” I’ve just updated the change. Thanks for reading To Jamaica and Beyond.